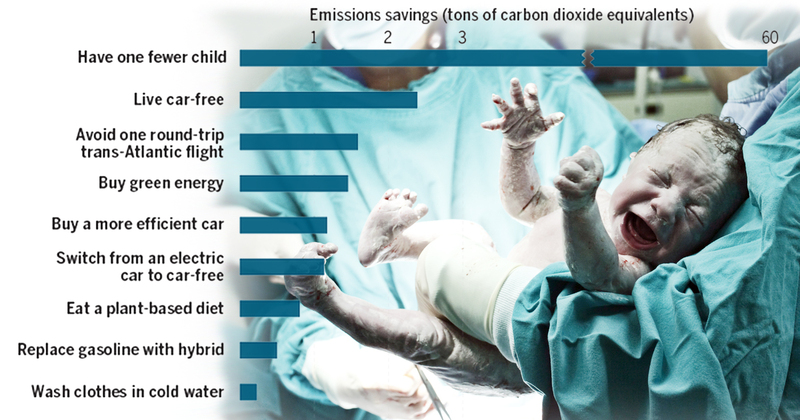 Would you be surprised to find that having fewer children is the most effective way to reduce your greenhouse gas emissions? I’m excited to honor Seth Wynes and Kimberly Nicholas at the University of British Columbia for quantifying the most effective carbon reduction strategies. Congratulations, also, to Kendra Pierre-Louis of Popular Science and to Sid Perkins and Science magazine, for reporting on this UBC study. Kudos, also, to the journal Environmental Research Letters, for publishing this study, which sought to identify the “high-impact” actions we can take, and distinguish them from actions which – while well and good – accomplish far less. This work is all the more remarkable for the fact that it spotlights a green behavior that’s traditionally received very little mention in “polite circles.” Fact is, our culture has avoided this subject like the plague. There is, however, no avoiding the scientific evidence that having one fewer child has enormous climate change minimizing benefits, truly dwarfing other strategies. If you’re serious about leaving our children a habitable climate, these are the strategies you DON’T want to avoid. The irony is not lost on me. The most loving thing you can do for your children is not to have any. Or at least stop after one. Or, if that horse already left the barn, don’t have any more! It should be noted that the 120 tons of CO2 reduction applies to the average U.S. resident (because each of us is such an over-consumer). The global average is a 58.2 metric ton reduction by having one fewer child. That is still more than 50 times the impact one gets from switching to hybrid car. The chart above shows the averages from all identified studies in “developed” nations. Even if public policy isn’t moving fast enough, we can all – ourselves – do much more, armed with information like this. Perhaps with more media coverage like this, more of us will get serious about heading off what really will be an apocalypse if we don’t. Chart Credit: The chart was created by Science magazine using data from the UBC study. I took the liberty of adding a little flourish with the baby background.